Developer Quote: "Do you find it tough making decisions?...Then it's time to Shake Up Your Mind!" Whether you share an apartment or dorm, have a family, or hang out with a bunch of friends on the weekends, there is always a time when you need to make a decision. In the dorm, it could be whose turn it is to clean the bathroom. A family member has many decisions such as unloading the dishwasher or mopping the floor, while friends get to decide where to go for dinner or to which club or movie. 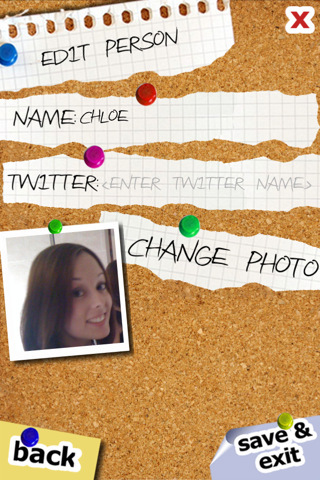 - Easy to add as many people by name as you like, with the option to add their twitter ID and a photo. 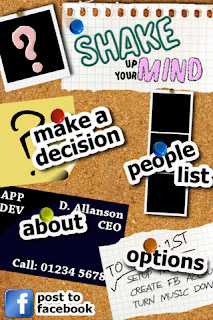 - Quick and simple to use system for adding new decisions or editing existing ones. - Browse statistics on who is the most picked overall and per decision. Settle arguments before they begin! - Tweet users when they have been chosen for a task, or send out a general tweet when a decision has been made. 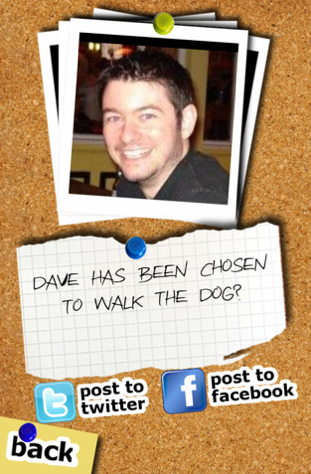 - Post your unbiased decisions to Facebook. When you open this convenient, decision-making app, your display will be a cork board with choices such as: Make a Decision, People List, Options and Post to Facebook. Along with those are scraps of paper tacked to the board so that it resembles a real chore board in your own home. Perhaps start off by either modifying the Make A Decision or People List. 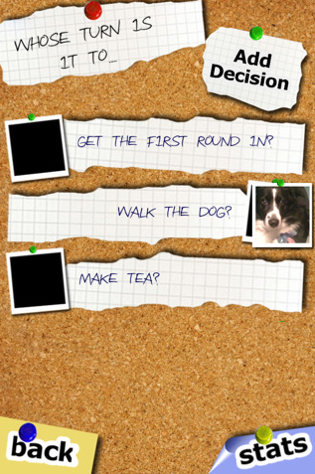 If you choose the first option, there are a couple already made task questions for you. However, it's simple to edit those or add your own big task by tapping Add Decision. Tap the Name box and the keyboard will pop up so you may type in your task. Once that's done, choose to Add Photo as an option, and then Save & Exit. Now you can tap your Decision and then Choose People to add a group of names from which to select later. You will enter their name, and perhaps their Twitter ID then save. You need at least 2 people from which to choose. Ideally though, the more the merrier! I made up a Decision titled Who Cleans The Fridge? Then I added in 4 friends and tapped Confirm. I tapped Shake Up Your Mind at which point those 4 names were placed in the middle of the cork board. I had the option to either shake the phone or tap the names so that a question mark appeared, and then one friend was displayed as the task winner! At this point, I had the option to post the results to Twitter or Facebook. Yes, it's that simple to work with a group of people, whether or not they are present, to let them know of the big decision of the day! Furthermore, should anyone think they are being picked on unfairly, use the Stats option to verify who has been the most picked person of all for any particular task. Now that's a definite plus in defusing any unpleasantness! Use this app for almost any group decision any time of day or night. Get rid of arguments and indecision once and for all with the friendly and helpful, Shake Up Your Mind. COOL CONCLUSION: "It's never been so easy and stress-free to make a decision than with the convenient Shake Up Your Mind fun decision-maker!" --Special Note: INTRODUCTORY OFFER: 50% OFF FOR A LIMITED TIME ONLY!